Grants Tinned Haggis brings Scotland’s most traditional dish straight to your dinner table. Haggis is stuffed ewe's stomach, a dish exported in more than 40 countries worldwide. Made only with the finest ingredients, this delicious Haggis combines lamb, oat flour and spices for a succulent and nourishing meal. Haggis has been flagged as a typically Scottish meal by Scottish Poet Robert Burns and his famous "Address to Haggis". Every 25th January, Scotland serves the Burns supper as an homage to this iconic Scottish figure. The Burns supper has been a national celebration for two centuries. A ceremony is still followed in some pubs but has been simplified in a majority of homes. For over 120 years, Grant's offers very good meals made with traditional scottish and irish recipes, with the famous Haggis. Grant's Haggis is present in more than 40 countries worldwide. Grant's was created in 1885 in Glasgow in a family butcher shop. The company makes very good irish and scottish dishes. Grant's respect the tradition of excellence by using the best ingredients for the best dishes. Ingredients: lamb lobes (45%), oatmeal (19%), water, suet, onion, salt, spices. Once opened, transfer unused contents to a non metallic airtight container, refrigerate and use within two days of opening. Can be served as part of a main course or as a delicious starter. Hob: Empty contents into au sauce pan and heat gently, stirring occasionally until warmed through. For a real Scottish flavour add "a wee dram" of whisky before serving. 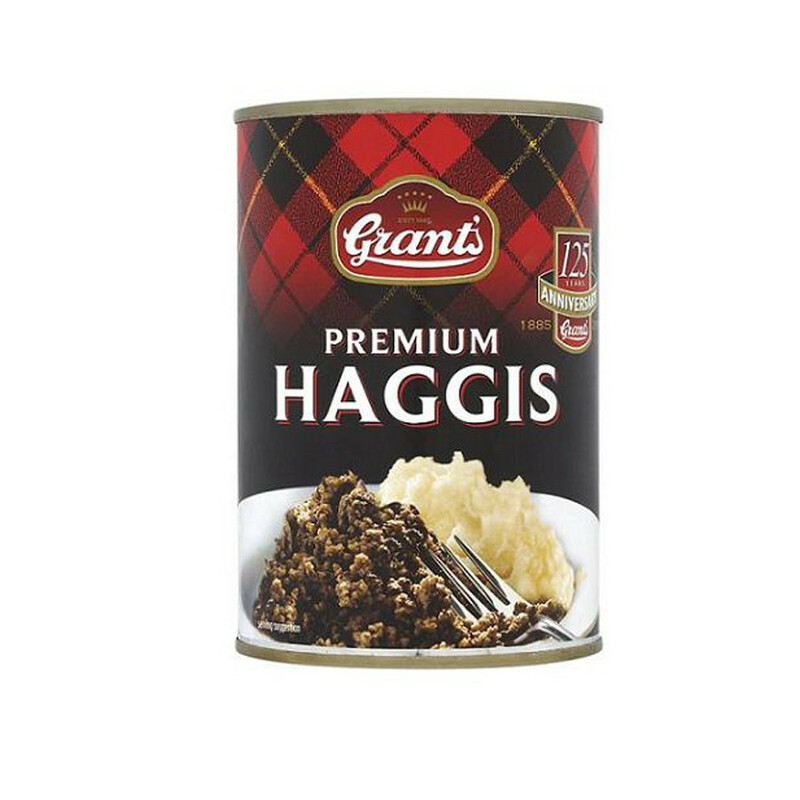 Microwave (850W): Empty content into a microwaveable dish, break up haggis with fork. Cover and microwave on fullpower for 4 minutes stirring half way through heating. Stir thoroughly and allow to stand for 1 minute before serving. Ensure food is piping hot before serving; Refer to manufacturers instructions for different power.